I did it. My First Tablescape. I loved it. Thank you so much Susan @ Between Naps on the Porch for hosting Tablescape Thursday. 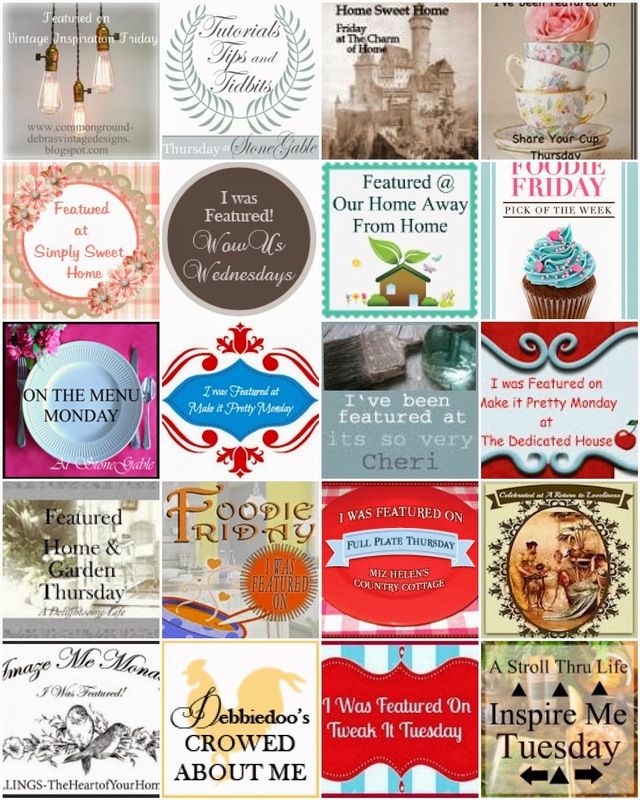 I 'm also joining Leigh over @ Tales from Bloggeritaville for Thrifty Thursday. Please jump over and visit their blogs. You are in for a treat. Thanks for stopping by. Please leave a comment. I love to read the comments and try to answer them too. Hi Betty, Welcome to Tablescape Thurday! You set such a lovely table. I am a silver fan too, and your goblets are exquisite! You have a very good eye for shiny things, my dear! 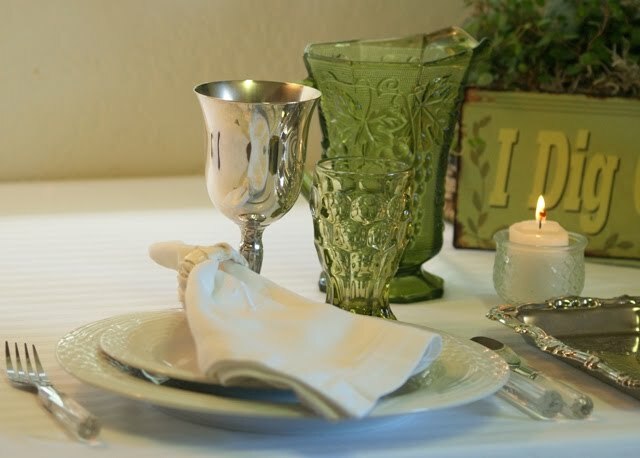 YOur table is calm and serene with the green and white. It is a favorite color scheme of mine. I can't believe you got you flatware from a Big-box store. A real find. You put all these lovely elements together in a beautiful table. I hope to see more tables from you. So fun to visit you! Betty, you did a great job with your first tablescape. 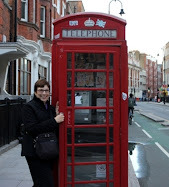 I'm quite new to this whole idea of blogging, but am absolutely loving it. I've always had a passion for dishes, glassware, silver, table linens and just about anything else that can go on a table. Thanks for sharing. Pretty in green, I love your silver globlets!!!! Love the goblets too! Such a pretty green tablescape. Your silver treasures are exquisite. Love the goblets! Nice centerpiece too! 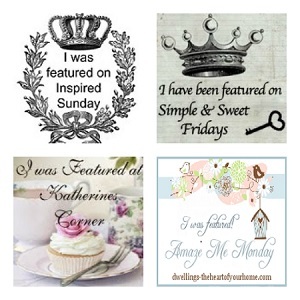 Welcome to Tablescape Thursday; it's fun! Great job!! Your table looks wonderful. Can't wait for #2! Very nice! Loving the greens and the garden sign! I agree with all the ladies in here. 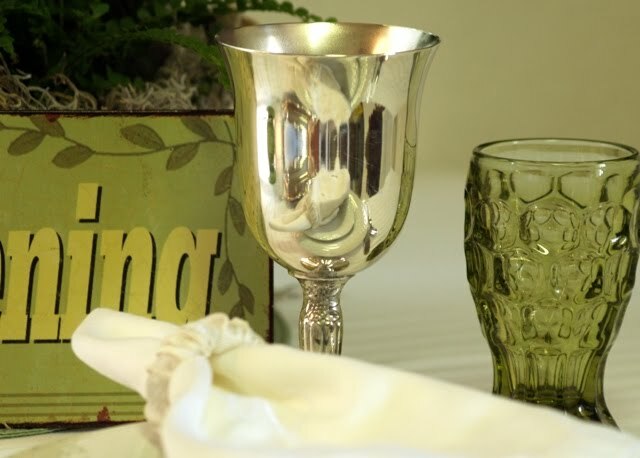 I adore the silver goblet too. 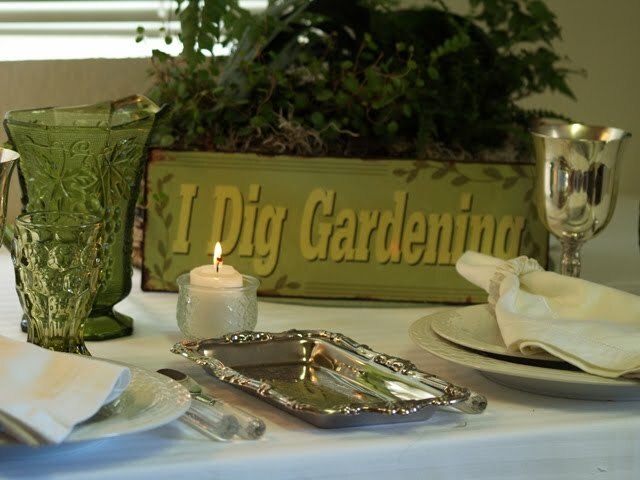 You set a lovely table and that I Dig Gardening sign is so cute! I need one of those! Welcome to the gang! Your debut table is SO inviting -- I love the soothing green and white with the sparkle of silver. Come on over to my house -- I have LOTS of silver that needs polishing! Looking forward to your next tablescape! Oh, and my mother has a continuously blooming orchid that is set in a west-facing window. Maybe yours needs more sun? It is just beautiful. I also like to garden so of course green is always a hit with me. I adore the center piece (I'm a little more than challenged in the centerpiece area). What a clever idea. Hope to see your creations often. What a nice tablescape, great way to celebrate earth day! Great job on your 1st tablescape!!! Well done. I love your history stories and estate sale finds! 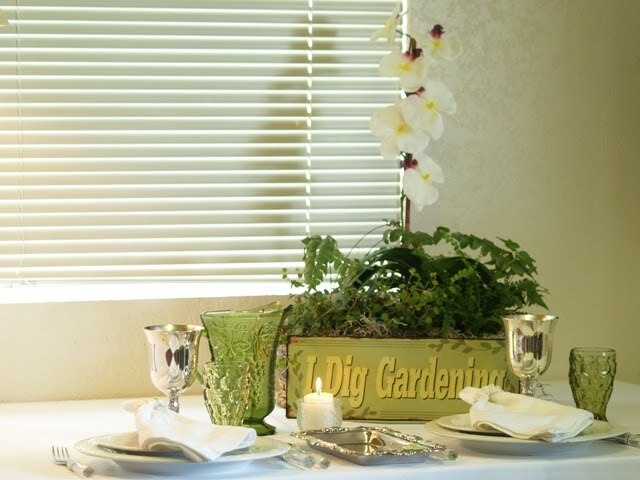 Love your "gardening" tablescape! Green and white always looks so fresh! Well done for your 1st TT and hope you'll be back often! This is just delightful. 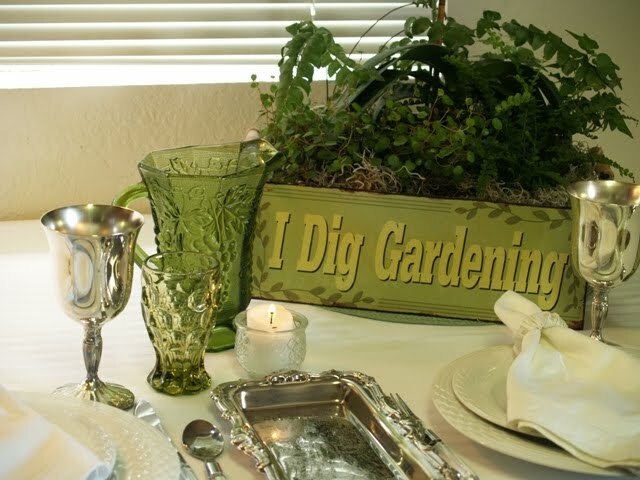 I love the greens and whites for your gardening tablescape; you are very talented with tablescaping my dear!.., I especially love the touch of the gardening sign! May you return again and again to join in the fun!~ Welcome! Betty, I LOVE it! 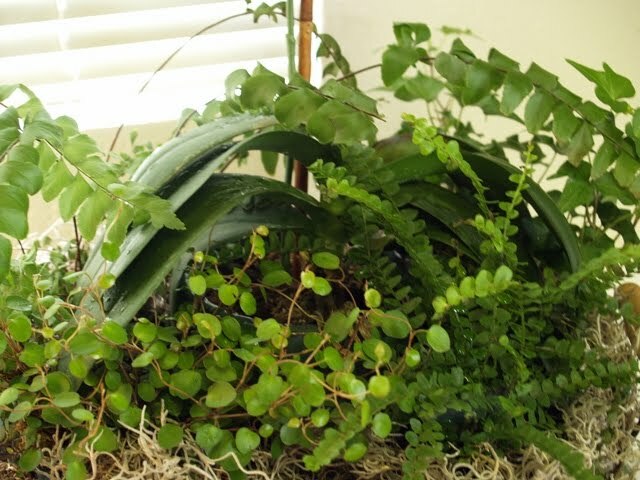 Green is my favorite color and ivy is my favorite plant, so it was a double traet. You really scored with the silverplate tray! And I love the sign your sister gave you. I look forward to more of your tablescapes. Hi Betty. Your best photography yet! I also love the large photos. Wonderful job. Also, love your angel vine and your green glasses and your 'I Dig Gardening' sign. hi betty! 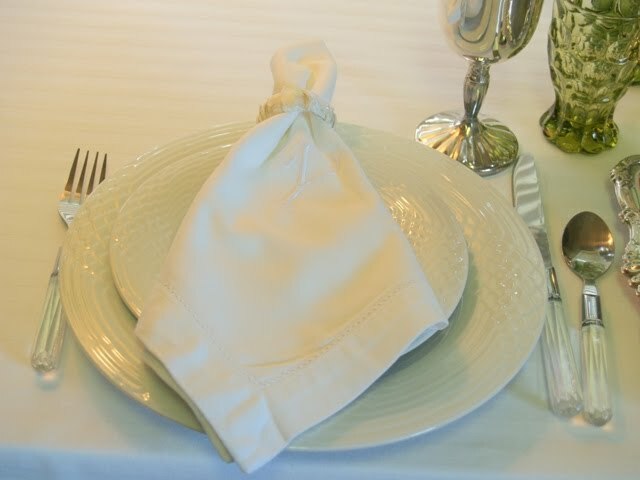 this place setting is beautiful -- i enjoyed hearing where you got each piece... and you coordinated them together so nicely! i just had a flashback from about 40 years ago when, during a 4-H meeting, we were taught how to set a table and in doing so, make it look attractive & appealing. (maybe i should have been paying closer attention!) i like these shades of green you used -- they're so natural. thanks for sharing, betty!